I was sewing the little blue deer and Esme got talked into trying to sew herself a toy. I made the knot and cut out the felt and she took great care in sewing (for a nearly six year old).. and actually did a good job with the weird bits of thread not wanting to go your way, when you accidentally catch the thread inside the loop etc.. I told her she was a natural.. barely cried when she poked her finger several times. And she finished the project and was very proud of it! We started Wind in the Willows on a reminder from Grandma that it is in the same set as the Wizard of Oz.. I'm reading it to her and explaining words she doesn't know, like 'predicament', 'delighted', 'fascinated'... see if she absorbs any of it. Esme got two 'happy faces' for the week, which means no time out for those days, and about evened out the actual time from last week even so... but to celebrate we went out to the fast food with the playplace, and returned our books at the library. The Jacqueline Kelly book 'Return to the Willows' was one that I picked up at the library, which led to finding the original in her set. While at the library Esme actually went and picked a book out this time, instead of beelining for the blocks and computers. That is something to note. She picked out a Clifford book, and I found two more appropriate 'read it together/myself' variations. She heard me tell Grandma that she needs more book than what they were giving her at school.. she made sure to lean forward in the car and say she heard that - she needs more books. She has told me more about where things are at school, her cubbie, her pouch in her chair, her hook on the wall. I like hearing her describe those clearly. She is working on her letters and on following directions a bit better. Need to start looking at counting by 10s. After we got home, Esme was very sweet before we went to the lake she brought us both drinks again - she keeps bringing me the green ones because she knows they are my favorite - green things etc.. *ha* but I poured up tea this time instead. She ran laps at the lake, we rowed the boat a little, then home for an apple pie and cartoons. I work the weekend, and have I think Tuesday and Wednesday off. I should sew out of my fabric pile but it appears I'm still recuperating a little because I chose Minecraft instead today. Also starting to have inklings of organizing a few things for birthday... but definitely not doing a child herding experiment.. might just have her give out cupcakes and light sticks at school and then get a few presents after school at her Grandma's house with a homemade cake again. I dropped my ring downstairs and Esme helped me find it. She asked me where the writing was in it - to say I was married to Daddy. I told her there was no writing in it, it was something I remembered each time I looked at it...and Daddy had one that looked like it, and they matched. I said maybe someday she would have a baby and a ring that said she was married to someone...when she was all grown up, to which she stood up straight and said 'I will tell the baby 'no no you be good' and it will look at me, and the little child - that is mine - that child, will it be a boy, or a girl? Which one Mama?' I told her she will have to wait to find that out - a long time... and she seemed satisfied with the idea. We had the parent teacher conference the other night. I wasn't unhappy with the results, but still think they don't see the real Esme... and it is my job to help with that - so she is treated like a smart child by all of the instructors - and then they will see improvement all around. I think her speech teacher can be an ally with this. I followed up with an email about what she had said the other day - about (someone, children, teachers maybe both) thinking she is the child that does not understand, when she does understand, and it makes it hard to learn when they put her with the children who do not understand. I also sent them Minecraft screenshots of her world to show her creative side, and more home drawings and math work in her folder. She said yesterday to Daddy off the school bus that she was not a baby, and that it was a sweet thing. She didn't say much more... but I hope that is true. She told me this morning about not getting in trouble for something the day before because she did the right thing, even though the other child did not do the right thing, and she knew they would cry when they did get the timeout - and they did, but she didn't. She said that was a hard decision, whether to have them cry alone or be in timeout with them. I agreed it was tough - but she had to show she knew what to do and maybe the child would understand better then, too. She said maybe. She drew a mama mouse with a baby inside, and told me the baby would be small and pink and eyes not there (because they are closed), and would have a small tail when it came out. She then remembered she wanted a pink crayon for her pouch at school, because she didn't have one. I said that was a great idea and put it in her bag to take to school. I put the mouse drawing and wrote down what she had said so the teacher can see her thought process there. She said they are doing some spelling of the words in the ABC book and she likes it but it is hard - and she has to read their book 'apple, bear, camel' sometimes and not hers, but ok... She read a pretty long book with me for bedtime. I ordered her another pack of reading club books that were a good price. She came back from the bathroom this morning and said in a very small voice to me that she was scared of all of the hair ties on the sink because she thought they were bugs and then she was a brave and looked at them and they were not bugs. I am glad she is advocating a little for herself, even on tiny things like the crayon - and talking to me about the things that are hard for her at school, so I have insight and can help. I relayed a little of it to the teacher in email - because once they see what is going on inside her head, they might interpret things differently than just 'she is copying' etc etc.. with the timeouts. We took a couple of walks to the lake today, it was nice and sunny and not too hot out. These are the blue star morning glories... but I didn't catch them early enough in the morning to get a splendid picture. After the first walk Esme came in and made two signs that said 'DR.ESME' and went outside to the truck to open her business. She said she was prescribing lots of exercise, do this and wiggle on one foot, check your heart if it is healthy, do situps, and pushups and jumping jacks... We then went inside and got drinks. Balance on one foot, like this, and wiggle. We found a pretty ladybug on the way to the lake, it was still there when I grabbed the camera on the way back. Now Esme is in the bath getting ready for the birthday party in a few hours. I'll have hair to brush and braid, and pick out something to wear, and present to wrap. Mark has made a ginger pork roast to bring with. Then there is parent teacher conference on Tuesday... promised Esme we might take her out on the lake in the boat on Friday after school if the weather is nice... that is my next day off. Almost hate to wake her, but we have to get ready soon. She lost her third tooth the other day - one of the top front ones. She received a little money from the tooth fairy, and Daddy took her out to buy a toy. After school today she asked if I would make a 'knitting or a sewing together' after homework. I made some ballerina shoes and a dress for the 'donkey' toy. Hoping to get out from under this by the birthday party on Sunday... will probably go into work today, but they won't get much of my brain following the body. I've sent Esme off to school today with her dinosaur book, and two extra Biscuit books we got in the mail. I think she is really glad she can read them - and that is the reason I got them. It will give her confidence that yes, she really can read well enough for some books. In the meantime, she wants me to teach her science - because they don't teach it in school. I didn't get far into that one yet - told her I would but would have to think about the best way to do it. She has been doubling numbers, so I started a tiny bit of multiplication this morning. I haven't done subtraction with her, yet... and I think that needs to be another book for her to start on. She surprised me wonderfully on Saturday with several things at the store I work at - she told me what a shutoff valve was for after examining it and opening and closing it. She knew what to do with a male and female part after looking at them, and remembered the word 'male' from somewhere deep in the past when we had looked at them. She knew the plug that threaded in was for stopping the water on that side etc... we walked to the electrical switches and I told her the basic idea of the power goes into it on the side. She said it was like the water and the lightning and the switch made it stop and go. She has some brain in there... I've always known that, and it is showing so much now. I am still fighting a cold - again - the day at the park on Saturday was not the best for me. The other thing she cried about was not having a cheerleading dress like the other girls on the same team.. but I don't think that is going to come to pass. We don't need Kindergarten cheerleaders in our house... science majors, maybe... but not cheerleaders. I might make her a dress with the blue and gold fabric the next time I get a chance - but if it looks 'like' the cheerleading dress but isn't... I'm not sure how she will take that. We had made a decision a while back not to buy the school merchandise when it comes to clothing -- too high of a cliff to fall of there. In her own way she told me I was dooming her to be unpopular... teen angst in a five year old body. I am glad she is getting better at expressing herself - and telling me what is important to her. This is the toy Esme wanted me to make for her friend's birthday - it is made with scraps of other things we had made recently in pink and purple. She has This Long Little Doggy I made years and years ago now - and she really has liked carrying it around as a toy lately. She wanted to make a pink one for her friend and urged me to make it last night when we got home. This is the dinosaur book she devised with me while sitting at the restaurant yesterday. So, this 'The Dinosaur and the Flashlight' book is copyright 2013 Marie and Esme Lamb. She did a fairly good job reading most of the words, several of them are past tense which she needs to work on. Mark caught this picture of me using Esme's crayons and markers to make her another book. She told my boss today that she got to read 'The Rat and the Rhinoceros' to her class one day... I'm not sure if she really did. But if she does get to read them, I will send them. We had a BIG day out on the town today, lots to process... and she made plans for what to make for a birthday gift for her friend next weekend. I made it tonight and put it away. I think it turned out really cute and I'll probably take pictures and post but I don't want to spoil the surprise for the other girl's family by posting anywhere else. Esme has been asking me two weeks now where her gold pants and blue shirt are - not in a mean way, which is good.. but I haven't gotten to them. I know that means she wears one of two or three coordinating items each week for Blue and Gold day.... And I've had days off - we've just been focusing on other things, like her behavior, reading and math. I have the blue and gold fabric ready to lay out. But, the chair I was making for her is also taking up the table and I haven't dove back into it yet. I also promised a playground trip and 'fun things' this weekend if she brings home a moderately good report 5-10 minute timeouts per day etc.. I think she is there - and I will take her out and spend time with her regardless. She is making so much progress. Her words still turn inside-out sometimes and she will pick the wrong one and not even notice it still. Sometimes she corrects herself, other times I have to choose if it is a good time to correct her. She is also picking up lots of other phrases from school she wouldn't get at home, and trying to use them, and when I ask her about a word I am not sure she knows she often gives me a good definition of it. We talked about 'obstacle' the other day and 'reception' today. We've been talking about 'the rest of'', 'since' and the topic of verbs vs. nouns and nouns becoming verbs vice-versa. She keeps surprising me, which is excellent. This is also the weekend before the 'full week on', so if I don't accomplish some things in the next few days it will have to wait a long time to get a moment. I have been wrapping my brain around the math course I am taking online and I think it is coming along very well - it is not for credit - although it could be if I arranged to get into one of the study groups and really participate... with clothes to make and work and other homeworks, I think my efforts are pretty good. A happy report. I sent one of our Mama-made books to school today, one that we had made six months ago or more - and that Esme proved to me she could read most of this morning. I wrote the three words she had trouble with on the front of a postit note and a request to return the book. Esme said she got to read the book to the class and the teacher and children liked it :) That was unexpected but excellent for her confidence. I sent the book mainly because I wanted her library choice to not be limited below her level - and it wasn't, the library book is a very good match. Her math worksheet today was decent for her level, as well - and something we haven't specifically covered yet. I think they might be really getting to know her now, and especially because her behavior has improved. She got 5 minute timeout (by her report) today, and 5 and 10 minutes the other days of the week - we see the real results tomorrow. I said I was waiting to teach her half? She has an idea of it, not quiet spot on - but I have a color half of it worksheet printed out she is ready for. She also told me they are going over the 'fewer than', 'greater than', 'more', 'less' that I had put in earlier in the week.. she got about 80% of those right when we were talking, and was happy to work on it, ask questions etc etc... This is what she needs to work on, and if they are really working with her real needs I am very happy and feeling like she is more understood. original story 'The Cat and the Bird', copyright Marie Lamb, 2012. I remember this day twelve years ago.. and I am very different than I was then. I know who I am better than I did then... maybe not always still where I am going. I know we have a bright future but we have to work for it. Esme was bubbly this morning, she wanted to do so much we had to run for the schoolbus. Those extra 15 minutes I've been trying to incorporate every morning have been setting her up well - she thinks about rules, what she should do and not do, and has time to do some brain stretching exercises/worksheets so she can think about that when she is bored later. She had a dream she wanted to make a drawing of. Then she wanted to do the math sheets I had put out\ first. She tried to draw the dream but looked at the clock and said she would finish it later (impressive, for her.. she hasn't done that often). Then she really wanted me to write a story in her notebook to take to class and read during naptime. I don't know what the teacher will think about that. I sent her an email with an explanation and that I had laid out the rules for it if the teacher agreed. 1.) It comes out of the backpack during naptime - and then back in before snacktime. 2.) she does not bug the teacher(s) to write in it for more to read 3.) if they say no drawing/writing in it she has to just read and look at it. We'll see what happens with it. She wanted to read it on the bus this morning, too - so hope she does not lose it. She was telling me all about the rules for books from the library. They went over those last week - and she is excited to get to check out a book tomorrow. She is a little upset some children are calling her ZipZip at school, for talking out of turn? I'm not sure. She didn't seem to know why they are saying it, but she says they lose their stickers for talking. That could be one of those disconnect things where she knows what happens but not one happens because of the other etc.. We still get a lot of those. Homeschool : We did 'more' on her worksheet for school.. it said to read all of the sentences and had pictures of words the kids did not know yet. I had Esme tell me the word, write the word and color the pictures besides just reading it. Then for morning I gave her a sheet of addition and a sheet of more vs. less. She had trouble with the word 'less'... we will work more on it. She understood 'more' but did have to think about it. She had to think about 'more vs. less' much MORE than 2+2=4.. I want to introduce 'half' to her soon, but not until we have more and less worked out better. Not to self : talk about 'equal' as well before we go to 'half'... more, less, equal.. two equal halves etc. 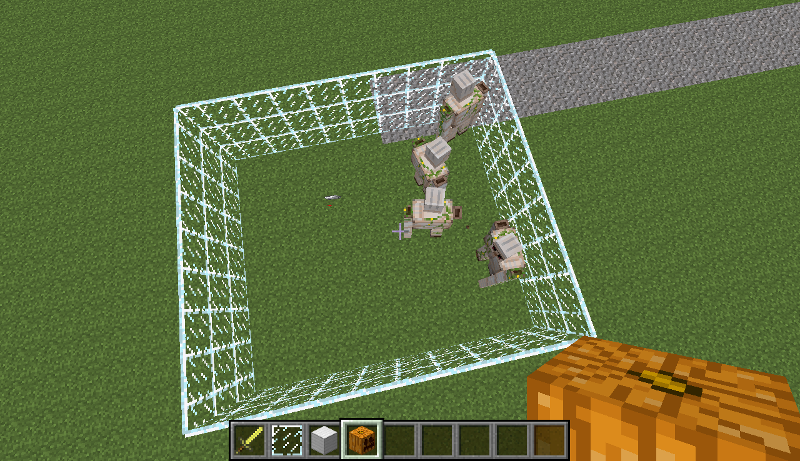 Esme watched a Minecraft video made by another child yesterday - and one of the things they had done was make an iron golem. 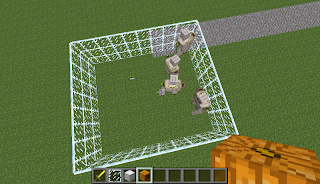 Esme was immediately in her Minecraft and making them, having them wander around in a glass cage (I did not help her find materials, I went to get coffee.. so she solved the cage problem on her own). After a while she wandered outside to play with the garden hose and I saw this on my screen and took a screenshot. She wanted to play checkers last night with her magnetic calendar. She set up the board, and had half the rules right.. but then she was cheating. I haven't brought up the rules to her before for this - she couldn't say where she learned them...kept interachanging 'chess' for 'checkers' and switching back. So, I brought up internet checkers (no cheating, rules hardset) and she decided 3/4 of the way through the game against a HUMAN without cheating it was hard. She had played the computer and won, but was still saying it felt hard. Having a human block her moves she was more upset, and frustrated... which in this case is probably a good lesson. I will look into making or buying a cheap gameset for her (we had one once don't know where it is) because it seems like something that is 'in line' with her way of thinking, as long as she follows the ruleset. Esme said this morning she wanted to do the 'two ones and the two ones and what is that and on and on do those math'.... translate that? She wanted to start doing two digit math. We did some simple ones and I know we will need to have a lesson on how to carry over....that will take a while for her to get in her brain perhaps.. but she can add numbers without carrying over quite well. Last night we argued about 'go back the words'.. she was trying to ask me to go back to the beginning, or start over... It feels so odd sometimes she can come up with 'whoa' questions and thoughts and yet we can argue about the word 'soon'...or 'at the beginning', or to say 'she does' instead of 'she do.' But at the same time I see how she is growing in every way - and know it is working out here and there and everywhere. She told me about school, and T and J don't understand the teacher or do the things the teacher asks. She says M and C do understand the teacher, and she does - she is like them, she is smart, she shows the teacher she can do the things and write the words. But, she said - that T and J make it hard for her to work because they don't understand the teacher and they get her in trouble. She gets herself in trouble, too...absolutely she does, wanting to play and not follow rules, but I can see some of the above as well - it is hard when there are other bad examples. I saw M and C at orientation, and they could be good examples but probably a little cliqueish and unsure of different thinkers. Esme told me she was told at school she was 'weird' and we talked about that - that she is a thinker and some don't like that - but being a thinker is really great for science and math - things she likes. I get the hint that maybe Esme is trying to tell me she is noticing the language difference at the same time as the work difference and maybe she understands showing how smart she is and how good she can be can help. I hope it can. 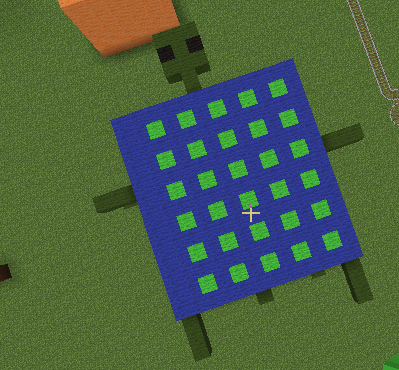 She made me this turtle in Minecraft. He has spots. Picture day is Thursday. She thought it was today, and was upset I had picked out a different dress than the one she wanted. I showed her the calendar, and she was happier about it. I had drawn a camera on it for the day to help her remember. She drew a camera on her paper for today to remember there would be a picture day. Her loose tooth is not out yet, but it might be by then... we'll see. These are books I made for Esme yesterday to help her work on some of her reading words. Mark says I should clean them up a little and start a series. original story 'We go Fishing' and 'The Fish Book', copyright Marie Lamb 2013. The other words she needs help with are the 'gh' words - they do not sound like they look. I put several of those words into this book (which actually came first), and other words like 'down low', 'always', 'funny' etc.. that she has needed a second look at in the published books we have read lately. see the three fish in the bucket, and I skipped that part, according to her. Math concepts she could work on, 'all' / 'some' / 'a little bit' and 'first' at the beginning / 'middle' or 'next' / 'last' / at the end. She could work on half of something, color half of this, how much is half of four apples etc... She is very good at counting and adding.. but the language parts are worth going over more now while her classmates are all working on the numbers 1-10.. she will be much more ready for the rest of math when they catch up if I can get her started on words they might already know. She is at school today, we have a town run.. I need to get things sorted out a bit, several projects in the fire etc. She had a good time with her friend the other night. And, she is about to lose another tooth on top now... three baby teeth since the beginning of the year.. oh my. We had a smiley face yesterday for behavior - not expecting perfect behavior today, but maybe - just maybe, the sun is shining through and they are 'getting' the right way to get the best out of Esme in school. She spouted math facts at me this morning (0+100 is 100 with two zeroes, working up to 100+100+100 is 300) and told me the principal said she was a 'good at math girl.' They also did work with triangles yesterday and making other shapes out of them. It was also library day, and when we went over the book rules to get a library card signature - she had been over them before and was proud to tell me about it. Her plan today is to make friends with the smart girl in her class who has a lamb pillow like hers.. and I finally did let her take the pillow in with hopes she will bring it back.. Grandma gave it to her. It is Grandparents Lunch today, too. Her preschool record dropped to them yesterday - maybe someone actually read it. Her previous speech teacher told me she was going to put Esme's abilities in there as well as what she needs to work on. I wrote a letter for the new speech therapist yesterday, too, about what I would like to add to her goals this year. Although she got the good report, she also threw quite a fit yesterday after she didn't "get the moon" for being good (she did get to go to a playground and play for an hour and french fries.. but she wanted MORE, a thing she has learned to whine about from school) and I told her I was 'sticking to my guns' with what I had told her she would get, and she would have to be good again to get it again.... Her face when she asked what 'sticking to gun' meant was just slightly funny. She whined all the way home. At home she did not get any more sympathy for her plight, and said she would not work for smiley faces, they were not fun...then she took it all back after she had an overtired tension cry and got ready for her bath. Being so good at school bottled up in her a bit, lots of unused energy etc etc... By bedtime, she was happy and ready to take on the world again. I think they are using positive instead of negative reinforcement now for her at school - or at least taking a try at it, and it is helping. Noticing what she is good at especially when she has said other children said she is 'weird' is good, too - I told her 'weird' is actually good, she is a thinker, and like me, I got called 'weird', too - but I like to think. but it was too late at night to send them -- took a picture this morning to do so. Doing more reading and math with Esme, trying to get her behavior better at school. It's tough, because the schoolwork isn't challenging for her, but the discipline and other things are. We want her to be considered for acceleration later, so we're trying to nip the bad behavior, teasing of the teacher, copying other schoolmate's bad behavior etc etc.. in the bud now. I have a few things coming in from the garden, still - beans, cowpeas and limas, a pepper here or there. I got two shelled paper plates full to overflowing of the Whipporwill cowpeas today, that was dried weight - it was epic compared to last year. There are more out there on the vines that are still green, more coming, lots have already been picked. It is a nice plant that keeps producing until frost. Also shown are some wild grapes and some beans I found growing up into a tree covered with honeysuckle. They were sneaky! Haven't worked on the chair yet today.. waiting for Esme to come home and for her progress report for the day from her teacher. Will go out to the garden to collect a few more items - had so many cowpeas in my bucket earlier there wasn't room for anything else! Joined the book club for Esme's class, ordered a first grade level reading book, have another bid in a set of related books.... This is above and beyond the book I told her I would buy her if she shows improvement this week on her timeout minutes. Bribery, Mark says.. and yes, it is. But bribery with books is a bit better than candy or toys... it encourages her to read. If I was really evil, I would be bribing her with math worksheets ;) but so far, she does like those, too - I had one on her table this morning and she was right on top of it, marker out, doing the addition problems like a pro and comparing one to the other. She liked it well enough I printed out some to put in a folder as backup so I don't have to go looking. I should sew some more clothes but there is tomorrow off, too. Asked for a parent teacher conference for next week if Esme does not show an effort at improving her behavior. Of course she says she will... but she also agrees/admits that it is very hard. Update: Esme did slightly better today at school... seemed she might have listened some - and we will positively reinforce today, hoping it will make her want to improve more. We got this far, added two more crossmembers to the back to help support it - and will save the rest of it for the days off this week. But, it is starting to take some shape. This was a project sparked by a cardboard and plush one Esme saw in the store - and I told her we could probably make 'something' like it. It would be filled in with more stuffing, chair padding and then covered in upholstery fabric.